Felix Arvid Ulf Kjellberg, to give his birth name, was born on 24th October 1989, in Gothenburg, Sweden. He is widely known under his online pseudonym PewDiePie. Youtube channel under the same name is produced by Felix and has more than 36 million subscribers as well as 8 billion views. Currently, it is one of the most frequently subscribed channels on Youtube. It has been active since 2010. How rich is PewDiePie? Sources have announced that his net worth is as much as $15 million, as of today, however, as PewDiePie earns more than $102,800 a month which makes more than $1.2 million a year, his net worth is likely to grow quickly. Felix was born and raised in Sweden. After graduation from high school, PewDiePie entered Chalmers University of Technology, where he studied Industrial Economics and Technology Management. However, he dropped out of the university before graduating with a view to focusing on his work. He found the idea of playing games and having fun more attractive and possibly financially efficient than studying at university. The channel under the title PewDiePie was created in 2010. The popularity of the channel grew every day, and within a few years the number of subscribers has reached 15 million, at which time PewDiePie became the most subscribed channel on YouTube. The format of the channel includes game videos and commentary. PewDiePie is popular as an action and horror video games player. His videos are known to be full of dirty language, offensive and crazy. Critics describe his videos as irritating in manner, though subscribers love his style and find it very attractive, alive and charismatic. Recently, PewDiePie won two Starcount Social Star Awards (2013), Shorty Award (2013) and Teen Choice Award (2014). He was also nominated for the best gaming channel given by 4th Streamy Awards (2014). His channel has added much to his wealth as well as fame. 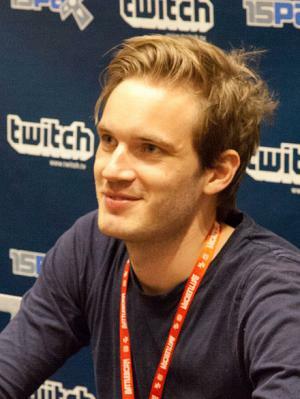 Despite playing and commenting various video games, PewDiePie had an ambition to create his own video game. Using various ideas given by the subscribers as well as his own thoughts, in collaboration with Outerminds the game has been created. It has been revealed that the characters include PewDiePie, his girlfriend, the pet dog and others. The game is entitled “PewDiePie: Legend of the Brofist” and will be launched in the summer of 2015, and released onto Android, iOS and PC platforms. In addition to playing, PewDiePie stars in the series and videos of other Youtube channels. He created the character of Mikhail Baryshnikov in the episode of ”Epic Rap Battles of History”. More, he appeared on the “Youtube Rewind” (2013, 2014) series. PewDiepie hosted the episode of “Sommar i P1” show. Then he appeared in several episodes of the “South Park” series which is his favourite. Furthermore, the gamer has launched several charity drives and has helped to raise funds for “Water Campaign”, “Save the Children” campaign, St. Jude Children’s Research Hospital and others. In his personal life, PewDiePie is in a long term relationship with his girlfriend Marzia Bisognin. For some time the couple lived in the her native of Marzia, Italy, but currently they reside in Brighton, England. 1 Always refers to his audience as "Bros"
1 The thing that has made YouTube so successful is that you can relate to the people you're watching to a much higher degree than to the people you see on TV. 2 I just want to connect with you bros. That's all I care about, because you bros' support really means everything to me. 3 Comments are my main way to communicate with you bros.
4 I don't do interviews. 5 I make funny videos of me playing video games, and I share those moments. 6 When there's just so many games out there to play, Nintendo games just went to the bottom of that list. 7 The fact that Disney bought Maker Studios doesn't really change anything for me. 8 It was so much easier to connect with my fans when I was smaller. I could answer every message, and I enjoyed doing that. 9 Dropping the news to my parents that I was skipping my 'dream education' at Chalmers to sit at home recording videos while playing video games was not easy. 10 What I and other YouTubers do is a very different thing; it's almost like hanging around and watching your pal play games. 11 I'm not out to max my income. I think my viewers would call me on that right away if I did. 13 In the very few interviews I've made, it doesn't matter how long we've talked to each other, the headline is still just about my paycheck. 14 I'd like to help other YouTubers. 15 I often get recognized on the street. 16 I'm just so very lucky to be able to do what I do for a living, and giving back is a way for me to express my gratitude. I'm so lucky to be in a position to help people, and that's appealing to me. 17 I just want to entertain; that is my main objective and what comes before everything else. 18 When I started my YouTube channel in 2010, I never imagined that one day it would be the most subscribed channel in the world and that I would be a part of such a great community. 19 Everyone has played video games at some point these days, and video games are fun. 20 My parents said that sitting at home playing video games all day won't bring you anywhere in life. 21 With my channel, and what people associate with Internet, most people think it goes viral, you become this huge thing super quick. I never had an explosion or a huge thing. It's just been something that has progressively been growing. It's been building. 22 Save the Children is an awesome charity that has helped more than 125 million children around the world, providing everything from school books to food to blankets and shelter. 1 Stated in his July 2015 'Pewds Does Everything' video that the reason behind him not uploading to the series for about a year was due to a large-scale panic attack because he was attempting too much at once and not eating correctly, meaning he had to distance himself from the series. 2 Calls his subscribers/fans 'bros' and refers to his subscribers as the 'Bro Army', stating he wants to have a tender connection with his fanbase. As of September 2015, Kjellberg has over 39 million YouTube subscribers, making him the number one subscribed person on the site. He has surpassed Rihanna's VEVO account in subscribers and was only briefly surpassed in November/December 2013 by the YouTube Spotlight channel. 3 Often collaborates with fellow gaming vloggers Cryaotic, Markiplier, and CinnamonToastKen. 4 He is a big fan of Radiohead. When asked on a Reddit AMA what his top five albums were, he answered that they were all In Rainbows. 5 Is known for his outlandish video and editing style, including enthusiastic greetings at the start of his videos, playing of indie games (therefore causing an Oprah effect on their sales), shouting and screaming, tongue-in-cheek remarks, and extreme profanity. Kjellberg also does charity work - as promotional work for the horror movie As Above, So Below (2014), he traveled through the Paris Catacombs, and has also taken part in the ALS Ice Bucket Challenge to raise awareness for motor neurone disease. 6 Kjellberg, with the help of his fanbase, has raised over $37,000 for children with cancer, $450,000 for clean drinking water, and $250,000 for providing supplies to children worldwide. Combined, his charity work totals to over $1 million. 7 As of 2011, he is in a relationship with fashion and beauty vlogger Marzia Bisognin, better known as CutiePieMarzia. The pair met when Bisognin was introduced to PewDiePie's channel through a friend, and later e-mailed Kjellberg, telling him she found his videos funny. Kjellberg flew over to Italy to meet her. The two began living together in Sweden, then moved to Italy before finally settling in England. The two have been referred to as "YouTube's biggest power couple." Felix and Marzia currently live in Brighton, East Sussex, with their two pugs, Maya and Edgar. 8 His favorite video game character is Sho Minamimoto from the Nintendo DS game The World Ends With You. 9 He can play the guitar. 10 One of the first horror games he ever played was Dead Space. 11 Some of his previous jobs include working on a tennis court and at the harbor as captain. 12 He likes playing tennis, golf and going sailing. 15 Swedish game commentator who films his face and reactions to games.